Here is a post I did over at Sugar Bee Crafts a few weeks ago. I have this hanging in my baby’s room, and I just love love love it. Hope you do too! 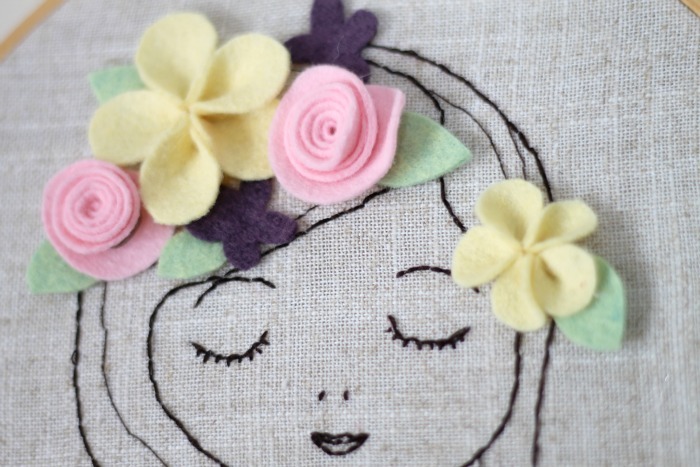 Today’s project is a simple portrait with felt flower accents. Before we get started I wanted to say something about the embroidery in this project–I often have people comment that they like a project, but wouldn’t dare attempt it because they are intimidated by the hand-stitching. I too am often intimidated by some embroidery, but this project is not challenging in the least. It employs the most basic stitch–the back stitch–which is literally just stitching in a straight line. Here’s a nice video tutorial for embroidering with a back stitch. If you own a needle, you can complete this project! Now that that’s out of the way, here’s the how-to. Step 1: Take linen and quilting pen. Sketch your portrait. I free handed mine, but it is also easy to trace an image on fabric. Just bring it up on your computer, tape your fabric to your computer screen and trace! 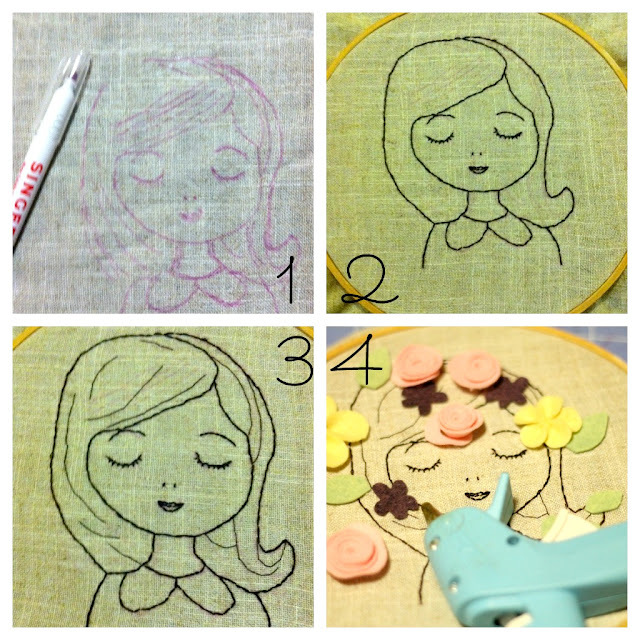 Step 2: Using three threads, Stitch the bold outline of your portrait. Use the back stitch for this step. Step 3: Once again using the back stitch, but only one thread this time, stitch the detailed lines in your portrait. For this step I added details to her hair. Step 4: Create your felt flowers. A tutorial for creating the pink roses can be found here, and a tutorial for the yellow followers here. The purple flowers are simply a flat shape. Step 5: Pull out the hot glue gun. First, glue leaves to the back of the flowers. Then when satisfied with your arrangement, glue down the flowers. Step 6: Finally, trim the excess material from around the embroidery hoop. I really liked your post and also enjoyed while reading and watching you post. It is very helpful for people who wants to make embroidery portrait, people can follow the steps which you have shared in this post. Que Deus a abençoe juntamente com sua família! Nancy, this is so so sweet… just lovely!!! I’ve been doing a tiny bit of embroidery, mainly for stuffed animal faces, and it is not easy. You are quite talented! Visiting from Yesterday on Tuesday. I adore this! I am thinking something like this would look darling in my daughter’s room. Just gorgeous! LOVE this-so beautiful! I am not sure I trust in my drawing abilities enough to try it though-haha. I will just admire your work. I’m a new follower and I hope you have time to stop by. This is beautiful! It makes me want to pick up embroidery. The felt flowers are the perfect way to top it off! Great job. super super cute. the flowers make it. This is BEAUTIFUL. The portrait is so simple but so perfect. The embellishment of the flowers is the sweetest touch. I absolutely love every detail. 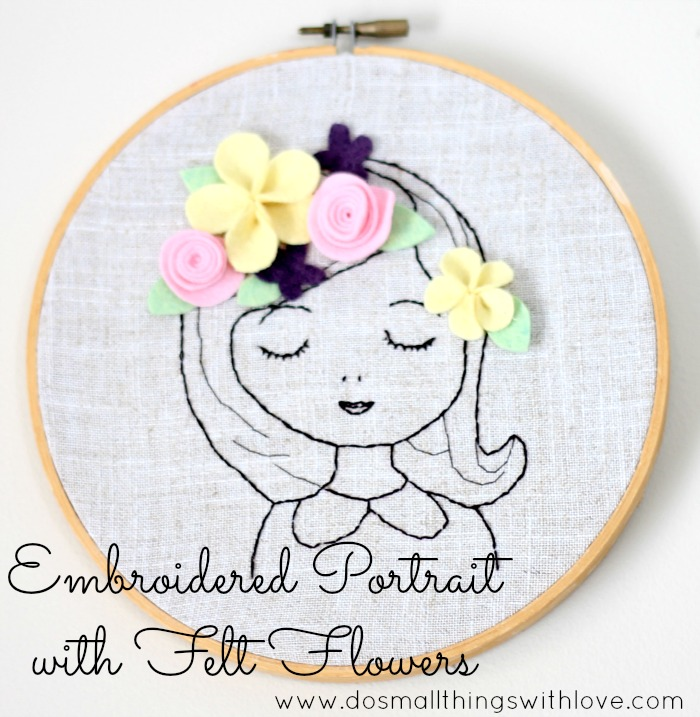 What a darling embroidery design! I’ve not spent much time with embroidery, but you make it look easy, fun, and pretty! I love this and found you on Sumo’s Sweet Stuff. I have been teaching myself embroidery and I am so intimidated thinking of trying anything other than text… but now I want to try this out! Thanks for the tutorial and the wonderful idea! 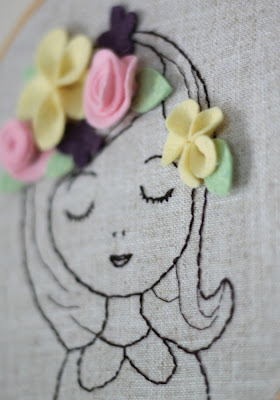 How pretty this is….I would like to try it for myself as I love embroidery very much! Super Adorable! Love all details!Thanks for sharing great tutorial! This is so beautifully done. Love it! This is super cute! I’ve just dusted off my old embroidery supplies, and this looks like a simple but beautiful project for my daughter’s room. Maybe she can even help me with the portrait for something we can do together! Thanks for the inspiration! Too cute! I know I did some embroidery as a kid. I may have to try another project now! That is so cute! I did my first project with felt flowers and they turned out pretty good and made for cute decorations on a yarn wreath! So pretty, Nancy! I love how artistic your crafts are! So cute Nancy!!! I have to make one now! That is so nice and simple! Oh my gosh, Nancy, adorable! I just adore this! Such a beautiful embroidery and I love the felt flower addition. this is so cute! and the flowers make a perfect touch.